My fiancé and I were sitting on the couch one night discussing what we were going to do for Halloween. We came up with several ideas, but nothing really sounded that great. My fiancé said “I just really want to be the most venomous marine animal”. Well the process began; we started researching what animal that might be. We came up with the Australian box Jellyfish. 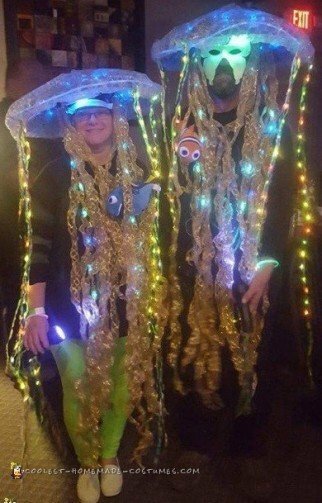 With that inspiration, we started gathering information all about Jellyfish and came up with glowing jellyfish costumes. The first thing we bought was an umbrella hat; we knew this would be the perfect shape for the head of the jellyfish. Next we had to figure out what colors we needed to make it look real. We came up with gold, green and blue ribbon. We wanted the ribbon to have a crinkle look, so we took each ribbon and held it over a hot gun and maneuvered it with our fingers to get the perfect look. Next, we picked up some bubble wrap and cut it to fit the umbrella perfectly. We then hot glued the bubble wrap to the top of the umbrella. Next, we took some blue lights and glued them to the inside top umbrella and took the remaining bubble wrap and covered the blue lights, this was in order to give it a under water look. We then took all the strands of ribbon and hot glued them to the inside of the umbrella. Next, we took white battery operated lights. We thought the lights were too bright so we cut up plastic blue, neon green, yellow, and pink straws and put them over the individual light and held them over the hot gun to melt them on. This gave us the dim light effect we were looking for. We used Velcro under the umbrella to Velcro a black light to. The lights were twisted around the ribbon. We used a blue glow stick to attach to the outer rim of the umbrella to give it a glow at night. After we were finished assembling both Jellyfish, we then took a Nemo and Dory stuffed animal and attached them to our Jelly fish tentacles. We both had a long sleeve black shirt that we painted a jellyfish on with glow in the dark paint, a mask we painted with glow in the dark paint. My fiancé used glow in the dark paint and splattered his black pants. I wore neon green leggings and I used glow in the dark paint for my white shoes. We both had a black light flashlight that we used to point at each other throughout the night to activate our colors. The whole night we had random people coming up to us asking if they could have their pictures taken with us. We really did feel like celebrities. It was the best night ever, we loved all the attention, and we loved everyone telling us we had the BEST costume they had ever seen. In conclusion, this was, by far, the most exciting and fun costume idea.